Schedule C, also known as “Form 1040, Profit and Loss,” is a year-end tax form used to report income or loss from a sole proprietorship or single-member LLC. You must file a schedule C if the primary purpose of your business is to generate revenue/profit and if you’re regularly involved in your business’s activities. Schedule C is due on or before April 15th for income/losses during the previous year. Download this IRS Schedule C Form and follow along as we will walk through the steps on how to properly complete a Schedule C. If you qualify as a single-member business and had less than $5,000 in business expenses, you may qualify to file Schedule C-EZ instead. A tax software like TurboTax will automatically select Schedule C or C-EZ for you. They’ll ask you questions to find out where the income needs to be added and they’ll prepare the schedule as part of your return. You can get started with TurboTax for free and only pay when you file. Since your Schedule C tax form is used to report income and/or losses, the first thing you want to do when completing your Schedule C is to get your Profit and Loss report for the prior year. You’ll also want to have your general business information ready, like an EIN if you have one. However, if you had less than $5,000 in business expenses, you might qualify to complete Schedule C-EZ, which requires less information than the form we go into below. Also, if you use an accounting software program like QuickBooks Online, you can simply run your Profit and Loss report for the tax year and use that to complete each section of your Schedule C.
If you’re not using an accounting software, we recommend QuickBooks. QuickBooks will ensure your books stay organized and save you time when tax season rolls around as you can simply print your profit and loss to prepare your Schedule C. Click Here to get up to 50% off QuickBooks Online. The first section of Schedule C at the top of the form requires basic information such as business name and business address. Below, you will find a brief explanation of how to complete each of the fields in this section. Line A: Principal business or profession, including product or service – Indicate the type of business you have and whether or not you sell products or services. Line B: Principal business or professional activity code – Select the code that best describes your business from the professional activity code list provided by the IRS. Enter that code in this field. Line C: Business name – Put the name of your business in this field. If you don’t have a business name, just leave this field blank. To learn more about how to select a business name, check out How to Name a Business – The Ultimate Guide. Line D: Employer ID (EIN) number – Enter your 9 digit employer ID (EIN) number. If you don’t have one, then enter your social security number in the field directly above line B. In general, if you have employees or operate your business as a corporation or partnership, then you need an EIN number. Be sure to read our article How to Apply for an EIN. Line E: Business address – Enter the physical address of your business. Do not enter a P.O. Box here. If you conducted business out of your home office then leave this field blank as long as that is the address that will appear on your Form 1040. See if you qualify for the home office tax deduction. Line F: Accounting method – Select the accounting method that you use to track income and expenses (cash or accrual). The cash method allows you to recognize income and expenses when you receive payment (income) or make payments (expenses). The accrual method requires that you record income and expenses as soon as the services have been provided. Line G: Material participation in the business – Material participation means that you actively participated in business operations and that you were not just an investor who attends a board meeting on occasion. There are 7 tests that the IRS has identified and you must meet one or more of 7 tests to meet the “material participation” requirement. Refer to IRS Schedule C Instructions to see if you meet the requirements. Line H: If you started your business in the current tax year, check this box. Otherwise, leave it blank. Line I – If you paid a contractor $600 or more during the tax year then you need to select “Yes” on this line. By selecting Yes, you are required to send a 1099 Form to each contractor who you paid $600 or more to during the tax year. A 1099 Form is similar to what a W2 form is to an employee. To learn more, check out our 1099 reporting guide. Line J – If you selected “Yes” on Line I then you should also select “Yes” on Line J. 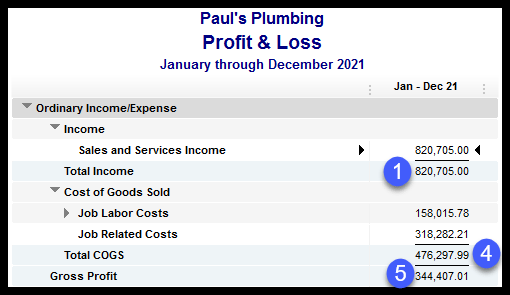 Below you will find a brief description of what information you need to report in the Gross Income section of Schedule C and where you can find this info on your Profit and Loss statement. 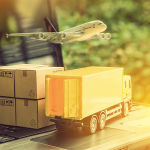 Line 1: Gross receipts or sales – This is the total amount of all product and services sold to your customers before taking into account any product returns or other related costs to generate those sales. Gross receipts will appear as the very first item on your Profit and Loss statement. In this example, gross receipts is $820,705. Line 2: Returns and allowances – This is the total amount of refunds that you gave to customers for returned or damaged products. If you reduced the selling price of any product, that is considered a sales allowance and should also be reported on this line. In general, returns and allowances will appear directly below the Gross receipts figure on your Profit and Loss statement. In this example, there are no returns or allowances to report. Line 3: Subtract Line 2 (Returns and allowances) from Line 1 (Gross receipts or sales) and enter the difference on this line. Line 4: Cost of goods sold – This is the cost of producing all of the products you sold. In this example, cost of goods sold is $476,298. Line 5: Gross Profit – This is the profit before any operating expenses. In this example, gross profit is $344,407. Below is a sample Profit and Loss statement for a fictitious company. The numbers in the screenshot indicate what line on your Schedule C you would put that figure. Below you will find a brief description of what information you need to report in the Expenses section of 1040 Schedule C and some tips on how to do so. Line 8: Advertising – Include money spent to advertise your business such as flyers, business cards, or an ad purchased on Facebook. Line 9: Car and truck expenses – You have the option to deduct the actual expenses of using your vehicle for business or taking a standard mileage deduction. Check out our guide to see which method will give you the largest deduction. Line 10: Commissions and Fees – Include any commission payments or referral fees made to sales reps or others. Line 11: Contract Labor – Payments made to independent contractors for services provided to your business belong here. Do not include any wages paid to employees on this line. Line 12: Depletion – Depletion is similar to a depreciation expense but it is to account for a significant reduction of a natural resource. This is typically used by mining, timber and petroleum businesses. Line 13: Depreciation and Section 179 – Include the annual deduction allowed to recover the cost of business equipment or investment property used in your business that has a useful life beyond the tax year. To learn more about how to calculate this deduction, check out our guide on Section 179 deduction. Line 14: Employee benefit programs – Deduct contributions you made to employee benefit programs like health insurance plans and life insurance. Line 15: Insurance (other than health which belongs on Line 14) – Deduct premiums paid for business insurance such as liability insurance. Line 16a: Mortgage Interest – Deduct any interest that you paid to a bank or financial institution for a mortgage that you have on a building you use solely for your business, such as a warehouse. You should receive a Form 1098 for the total interest that you paid. Line 16b: Interest (other) – Deduct interest payments that you made but did not receive a Form 1098 for. Line 17: Legal and professional services – Deduct any fees paid to accountants such as tax prep fees or any fees paid to an attorney who represented your business. Line 18: Office expense – Deduct office supplies and postage expenses. 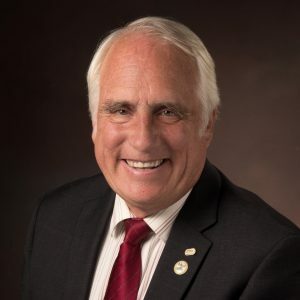 Line 19: Pension and profit-sharing plans – Deduct any contributions that you made for the benefit of your employees to a pension or profit-sharing plan. Line 20a: Rent or lease vehicles – Deduct payments made to rent or lease vehicles, machinery or equipment for business. If you leased a vehicle for more than 30 days, refer to the IRS Publication for additional instructions. Line 20b: Rent or lease other business property – Enter the amount you paid to rent or lease property such as office space. Line 21: Repairs and maintenance – Deduct minor repairs and maintenance that does not add to the property value. For example, paying a plumber to repair a toilet or to unclog a sink would go in here. Line 22: Supplies – Deduct the cost of materials and supplies used in your business. Some examples are books or small tools and equipment. Line 23: Taxes and licenses – You can deduct state and local sales taxes and licenses. If you collected the tax from the buyer, you must also include the amount collected in the gross receipts (line 1). You are also able to deduct real estate and personal property taxes on business assets, licenses and fees for your trade or business (i.e. business license), and social security and Medicare taxes paid on behalf of your employees. Line 24a: Travel, meals, and entertainment – Deduct expenses for lodging, transportation and meals while traveling away from home on business. Learn more here about deducting travel expenses. Line 24b: Deductible meals and entertainment – You can deduct up to 50% of eligible meals and entertainment expenses. Learn more here about deducting entertainment expenses. Line 25: Utilities – You can deduct telephone expense, water, electricity and any other utility expenses you paid for your business. Line 26: Wages – Enter total salary and wages paid to employees for the tax year. Do not include amounts paid to yourself. Line 27a: Other expenses – List any business expenses that you did not report on lines 8-30. Some examples of expenses that belong here are bank service charges, computer supplies/equipment, dues and subscriptions for trade magazines, and training and conference registration fees. 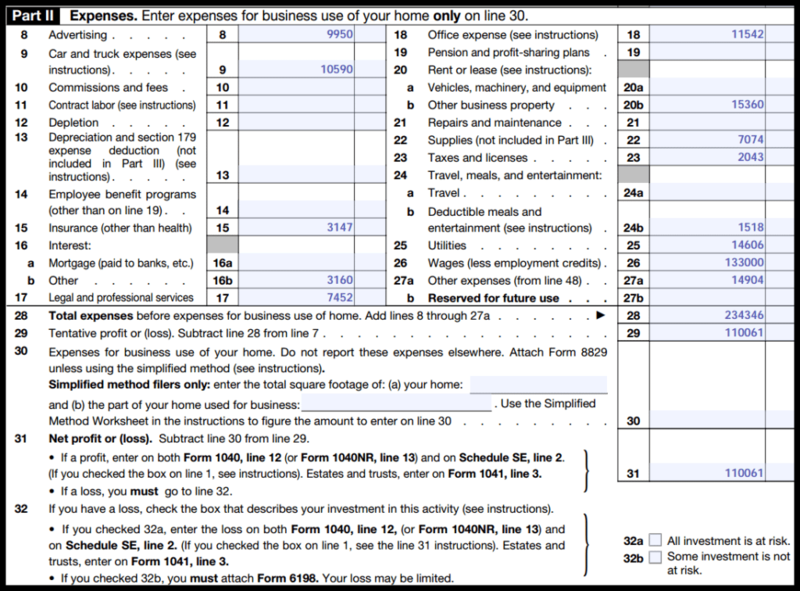 Line 30: Expenses for business use of home – You may be eligible to deduct expenses for the business use of your home. This is called the home office deduction, and you can learn more about it here. Line 31: Net profit or (loss) – Subtract Line 30 from Line 29. 32a: All investment is at risk – Select this option if you have a business loss and all of the amounts you have invested are at risk, meaning there is no protection against the loss such as insurance. 32b: Some investment is not at risk – Select this option if you have a business loss but not all of your investment is at risk because you have some sort of security or protection against the loss. In general, the at-risk rules will limit the amount of loss up to the total amount that you have to lose “at risk.” Refer to the at risk rules listed in this guide for additional details. Here a sample of the Expense section of a Profit and Loss statement for a fictitious company. If you use an accounting software like QuickBooks, you will set up a chart of accounts that will include all of your income and expense accounts. These accounts appear on your financial statements as indicated below. In general, if you manufactured, purchased, or sold products that generated income, then you need to complete Part III of Schedule C. Below you will find a brief description of what information you need to report in the Cost of Goods Sold section of Schedule C and some tips on how to do so. Line 33: Inventory method – Select the inventory valuation method that you use. You can value inventory using any method approved by the IRS. However, if you are using the cash method of accounting, then you are required to use the cost method to value inventory. Refer to IRS Pub 538 for more information on inventory valuation methods. Line 34: Indicate whether or not you had to change the way you valued inventory since last year. If so, you need to indicate a yes here and attach an explanation. Line 35: Indicate the inventory on-hand at the beginning of the tax year. This should match up with your ending inventory from last year. If it does not, you will need to provide an explanation as to why it does not. Line 36: Enter the total amount of inventory purchased less any product used for personal reasons. Line 37: Indicate any labor costs directly related to producing the products sold. Line 38: Materials and supplies – Include the total materials and supplies used to produce the products that were sold. Line 39: Other costs – include any other costs you had directly related to producing the products sold. Line 40: Add lines 35 through 39. Line 41: Inventory at end of year – enter the inventory value on-hand at the end of the year. Line 42: Subtract Line 41 (Inventory at the end of the year) from Line 40 to get the total cost of goods sold for the current tax year. If you used your vehicle for business and want to claim car or truck expenses on Line 9 but you are not claiming depreciation then complete this section of the form. However, if you are also claiming a deduction for depreciation of your vehicle, then leave this section blank and complete Form 4562 instead. There are some great apps on the market that will automatically keep track of your miles for you. Check out our best mileage app guide to see our top picks. Earlier, in the section on Part II Expenses, we covered line 27 – Other Expenses. 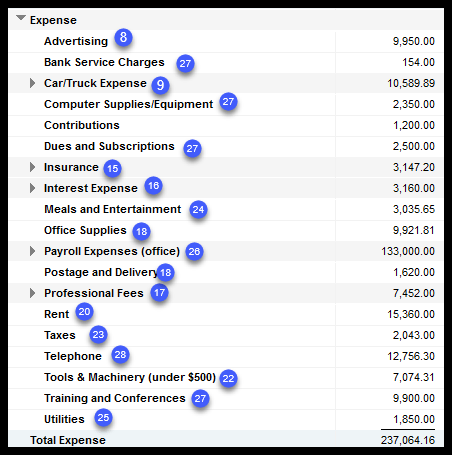 In this section of the form, we need to provide a breakdown of what those other expenses include. A good rule of thumb here is to avoid using “Miscellaneous” expenses as a description. You should clearly identify all expenses that you are claiming a deduction for. If you do have a miscellaneous expense account set up in your chart of accounts, consider getting rid of it. As discussed in the previous section, the chart of accounts is a list of accounts that is used to categorize your day to day business transactions. The accounts listed below (Bank Service Charges, Computer Supplies/Equipment, Dues and Subscriptions and Training & Conferences) are all examples of the accounts you would set up on your chart of accounts. Below is the sample of the Expense section of a fictitious company’s profit & loss statement. 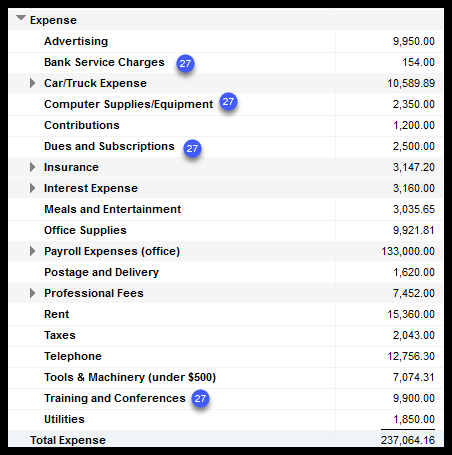 The highlighted expenses are considered Other Expenses. You would total them up and note the total in line 27 of Schedule C.
Schedule C – Profit and Loss from a business is filed along with your personal income tax return, IRS 1040 Tax Return. Therefore, it will be due on April 15 of each year like your 1040 tax return. If April 15 does not fall on a normal business day, it is due on the following business day. There are two primary keys to success when it comes to filing your taxes. The first is that should use an accounting software program like QuickBooks to manage your books. By using QuickBooks Online, which is our recommended accounting software program, you can simply print your Profit and Loss statement and use that to complete your Schedule C.
The second thing you need is to have a good understanding of what information the IRS is looking for. If you just don’t want to bother with manually filling out the Schedule C yourself, you can purchase TurboTax, our recommended tax software, and it will create one for you. Hi Jennifer, Your net profit or loss on line 31 of Schedule C should transfer over to Line 12 on Form 1040. If it does not, I would reach out to the TurboTax tech support team to see if they can assist. Thank you for this informative post! I have a new small business and am new to the Schedule C.
Can I use the monthly iCloud storage fees as a deduction on the Schedule C? I store photos I take for marketing my products in the iCloud. If I can deduct it, what line in the expenses section would I put it? Hey Cindy, great question. You can definitely deduct fees that you pay for cloud storage on your tax return. However, if you use it for both personal and business then make sure that you only deduct the portion that is related to business or set up a completely separate account for your business. The best place to put this on Schedule C would be line 27a (Other expenses). Ok, but where do i mail this out to?? LET’S SAY YOUR NEIGHBOR HAS A BUSINESS. HE APPROACHES YOU AND ASKS IF HIS KIDS CAN HANG OUT WITH YOURS AFTER SCHOOL FOR A COUPLE HOURS UNTIL HE’S DONE WORKING. HE PAYS YOU $10 A DAY. AND THEN AT THE END OF THE YEAR HE SENDS YOU A 1099-MISC. YOU WEREN’T INTENDING TO OPERATE A BUSINESS. Getting a 1099 doesn’t mean you have to file a business tax return. You can file a personal 1040 tax return showing 1099 income. Best to talk to your tax accountant or use a tool like Turbotax, which allows you to input 1099-MISC income.